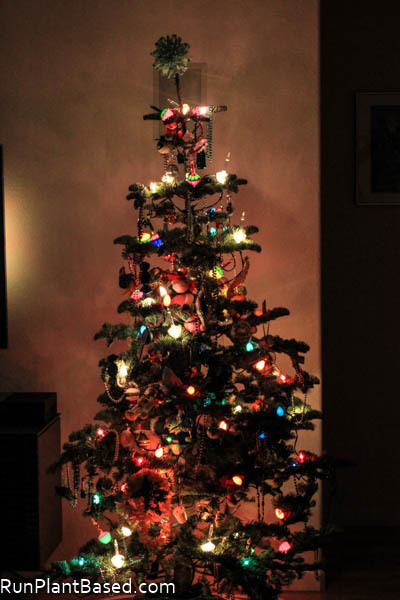 Our Christmas tree is finally up and I put enough lights on it for a few trees I think! 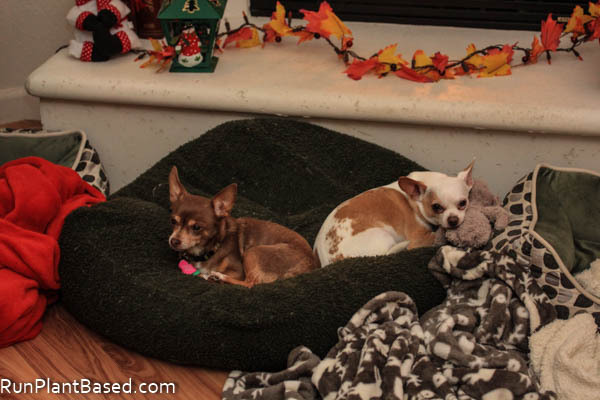 Christmas cheer is in the house too, these two have been peacefully sharing the cuddle cube bed in front of the fireplace which is rare. And lemon trees are in full bloom, I scored a huge bag of lemons from my sister to use up and more keep showing up at work. I used lemon juice to make simple, oil free, baked lemon dill potato wedges that came out good. 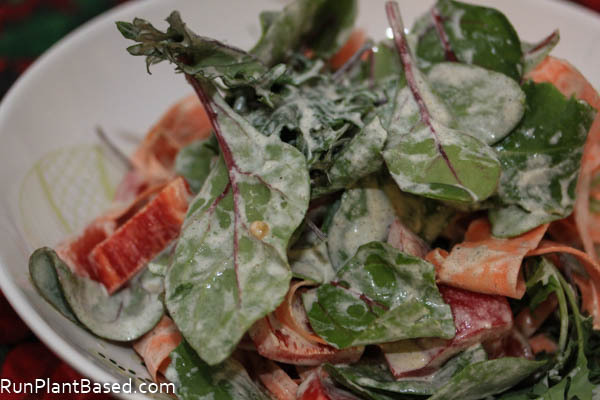 And used one up in this simple, tangy, and garlicy hemp dressing. 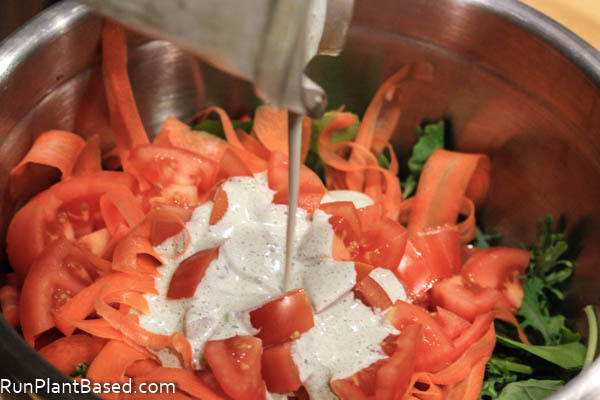 This creamy dressing is a comforting, summery flavor to enjoy when winter gets you down. And enjoy it coating a variety of veggies. 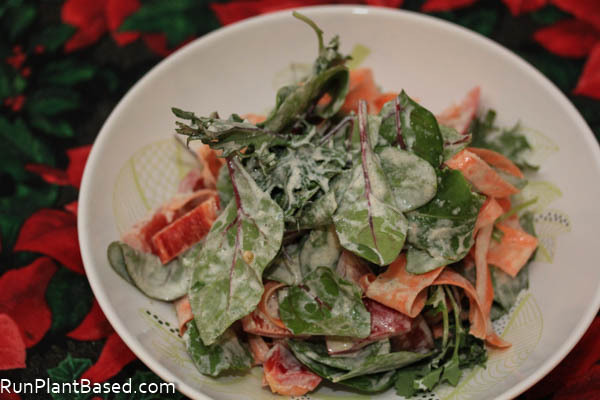 The creamy and rich texture packs a bright citrus zing and pairs well with a hearty meal salad. The strong flavor would also pair well with beans, grains, and many hearty salad ingredients. I love the new title of your blog!!!! And I’ve said it before, but I’ll say it again, you have the best dressing recipes ever!!! Lemon is the best flavor ever. It just makes my world go round. Your tree is adorable. I’m a total light freak, I put, I think 15 strands of lights on (what was I thinking!?!) The tree is totally going to topple over. Lol, or drinking it from the blender container! Lemon season! You don’t know how jealous I am of you Cali people-haha! That dressing sounds amazing. So true, Miko is a little cuddle guy and Leela is not so much, lol. I wish I could send you some lemons, I need to make room for tangerines from our tree next! The tree looks great! The chi’s so cute!!! 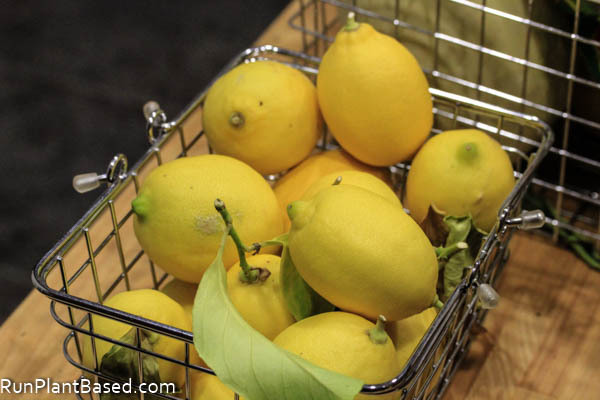 And those lemons…OMG! I want some! Thanks and I wish I could send you some lemons, still have plenty!